Talent is the most important asset in many businesses, yet people-related issues are often addressed informally, with a strong reliance on instinct. Analytics instead relies on objective data and deep analysis to remove subjectivity from decisions. In People Analytics: HR Transformation through Data, you will learn how data can and should be collected, analyzed, and used as a basis for decisions. 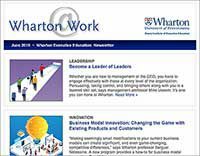 Wharton faculty will demonstrate how analytics techniques are being applied to create an employee-centric approach to talent management. 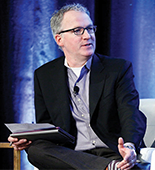 As the workforce continues to undergo radical changes — and management across generations, geographies, and worker expectations becomes increasingly more complex — data helps build practices that lead to better individual and organizational performance. The companies that can best harness the power of their data will continue to reap the benefits, and the advantages over their competition, well into the future. Academic Director Cade Massey says People Analytics: HR Transformation through Data is about making more rigorous decisions. People Analytics explores data-driven techniques for managing people, and for making more strategic, systematic decisions that affect the organization as a whole. It will help prepare you to take a leadership role in building an analytics capability in your organization, as opposed to learning the number-crunching skills of data scientists. Taught by the directors of the Wharton People Analytics initiative, the program examines the topic on three levels — data collection, analysis, and application — and offers state-of-the-art research and applications for each. By gaining greater insights into your workforce, you will be able to help them engage more positively and productively, and reduce risks. Because merely having data is not sufficient, better and worse uses of data are explained using real-world examples. You will learn methods for avoiding decision biases, including employing machine-based algorithms. Finally, best-practice approaches to drawing rigorous conclusions based on collected data from some of the world’s most successful companies are explored. This dynamic, hands-on program is a true learning laboratory, leveraging the latest insights and best practices to help you and your organization move to the analytics forefront. In addition to lectures, case studies, an industry panel, and exercises, you will work throughout the week in small groups on a real-world issue, running data analyses and making recommendations based on your findings. You will also discuss specific challenges with faculty and fellow participants as you begin to explore how people analytics can be applied in your organization. Professor Cade Massey on who should attend. People Analytics was designed for executives responsible for hiring and managing talent. Those who want to build analytics capabilities, improve the quality of talent, and learn better tools for managing and leading organizations will also benefit. In particular, the program attracts HR professionals, business unit and general managers, and leaders of mid-size to large companies. What is human resource analytics (HR analytics) about? Human resource analytics is the use of existing data and analysis to make better decisions about human resources topics. Common areas of interest include: hiring; increasing employee engagement; and gauging and improving productivity, collaboration, and diversity. Without analytics, those topics have been traditionally addressed through a mix of judgment, best practices, and prior experience. Workforce analysis is the use of data and analysis to better understand the characteristics of a current workforce and to optimize the makeup of that workforce by hiring the right people and managing them so they deliver value to the organization. Workforce analysis is also another name for human resource analytics. Why are analytics important for HR? Analytics are important for human resources because talent management involves hundreds of important decisions, and we know from elsewhere in business that decisions are improved with data and analysis. Instead of guessing, analytics allows HR to analyze in a structured way what has worked in the past. This informs decisions on who to hire and promote, and how to pay, retain, and assign jobs to employees. For example, you get a better understanding of who to hire if you know who is already performing well in the organization. The most fundamental kind of HR data is basic information about who you employ, in what jobs, how they perform, and what you pay them. Another layer of human resource data involves recruitment, and includes applicant tracking systems to collect information on who applies, who gets interviewed, who gets an offer, and who is coming. For some positions, HR data can also include detailed individual performance data. For example, at a call center, HR may know how many calls someone makes, how long they are at their desk, and how many sales they make. What are the HR metrics? Metrics are the basic measures used to evaluate the health of HR management within an organization. The most common human resource metrics include: turnover rate, employee engagement scores (self-reported), ratio of jobs filled internally versus externally, number of open vacancies and time to fill each job, how the organization is viewed in the external market, number of people hired through referrals, and pay raises (average pay per employee, increase in pay per employee). This is the application of analysis and data specifically to the process of recruiting people. There are two areas that analytics can help with. The first is optimizing the recruiting process. Analytics helps better determine who to recruit by using data on the performance of existing employees to understand which candidates are most likely to be successful. The second area is using recruiting analytics as a scorecard, tracking the success of the recruiting function. Key data points include time to fill, number of interviews per offer, offer yield, and cost per hire. This is a set of metrics used to assess an organization’s HR function. It can include topics such as engagement, turnover, growth in headcount, growth in pay, and vacancies. What does KPI mean in recruitment? KPI is the abbreviation for key performance indicator. It is used to track how well the recruiting function is working, and can include time to fill, cost per hire, offer yield, quality of hire, and number of people who stay in the job for a specific amount of time. When a company fills a job, it can find someone to work for them who is currently outside the company (external hiring) or look to candidates already working for them in other roles (internal hiring). What are the benefits of internal recruitment? There are four key benefits to hiring an existing employee. First, internal hires know the organization and culture already, and have established relationships. They therefore tend to perform better than external hires over their first few years on the job. Second, little or no effort is required for training and onboarding internal hires. Third, because so much is already known about the employee, it is less likely that a mistake will be made when hiring internally. This is because decisions are based on actual performance rather than on a resume. Finally, because other firms may not consider internal candidates, they tend to cost less than external hires. What are the advantages of external recruitment? Important benefits to hiring externally include bringing in skills and capabilities that are currently absent in the organization, adding diverse perspectives, and keeping the culture more open and dynamic. What is the internal recruitment process? Internal recruiting is finding existing employees to fill job openings. This may begin with the posting of jobs on internal job boards or through word of mouth. The process can also begin by identifying existing employees who need experience in other roles or who would do well in other roles. Then, the employees apply for the open jobs and a selection process takes place. The final step is acceptance of the job offer. Improving retention begins with recruiting: hiring people who are most likely to succeed in the job and stay with the company. During the interviewing process, be realistic about what the job will be like, rather than trying too hard to sell the company. This results in self-selection, with those wrong for the job dropping out. There are also many factors that can improve retention post-hire. Effective onboarding, creating a positive relationship with the manager, providing opportunities for growth, and communicating what a career path looks like can all improve retention. The job itself may also be redesigned to prevent boredom and to allow the employee’s strengths to be better utilized. What factors affect employee engagement? People tend to be more engaged when the demands of the job roughly match their abilities. Being stretched too far can create burnout, and not enough challenge can create boredom. Variety in work, helpful feedback, being able to see the results of one’s efforts, and being given autonomy also create engagement. Other factors include good relationships with coworkers and managers, and having a culture in which leaders are able to inspire people with a vision that resonates with their values. 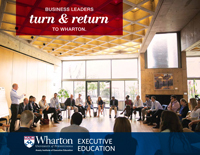 Wharton People Analytics: Using data to advance how organizations make decisions about people. Still considering your options? View programs within Strategy & Innovation, Marketing & Sales, Leadership Programs or use our Program Finder.